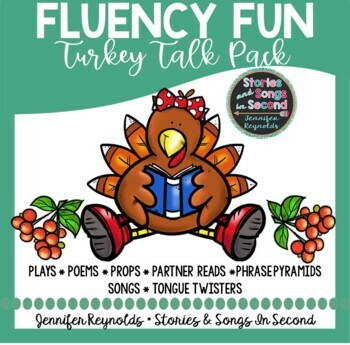 Your primary grade students will be gobbling and grateful for these fluency pyramids, fluency phrases, tongue twisters, songs, poems, and plays designed to help them be more expressive, and engaged readers! Research shows that repeated readings of rhymed and patterned text improves both automaticity and accuracy! Be sure to checkout the thorough preview to see all that is included in this literacy resource. The following activities can be adapted for both whole-group and small-group lessons. *Thematic literature recommendations and related links to music videos. 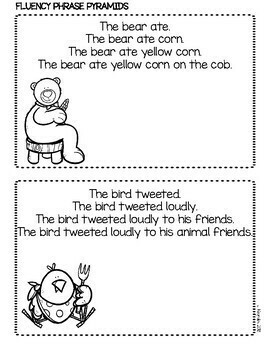 *Sixteen Thanksgiving-themed fluency sentences and voice choices. *Sixteen Thanksgiving-themed alliterative tongue twisters. *Four pages of traditional folk songs, related coloring pages, and online links to videos. *Two Thanksgiving-themed partner plays with color picture props. *One Thanksgiving-themed group play with color picture props. 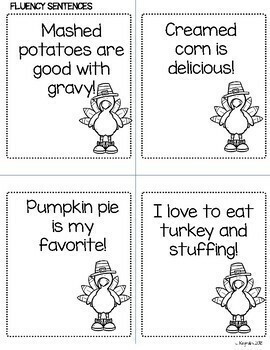 I recently bundled this resource with my Pumpkin Patch fluency pack. Check it out here for great savings! 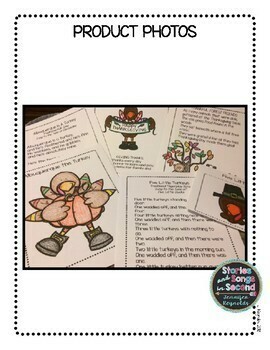 Be sure to check out my other holiday literacy packs as well! Thank you for your continued support and patronage of my store! Know that I truly appreciate your feedback on your purchases! It really helps me continue to improve my product line! If you are not already following me here, be sure to click on the green star next to my store logo to receive notification of sales, freebies, and new uploads!